The racing schedule will be available on Regatta Central. NOTE: Schedule is subject to change, so please attend the coxswain meeting for updates on Saturday or visit the Information table. Please print your own schedule. We have limited hard copies of the schedule. 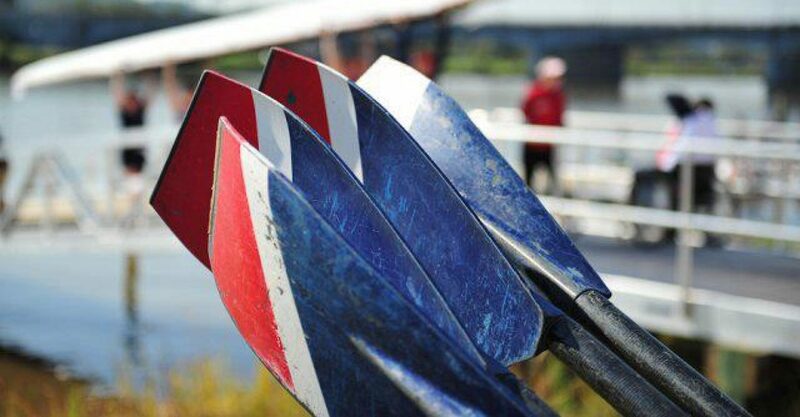 IMPORTANT: Due to the anticipated size of our regatta, teams with trailers and car top scullers must schedule an arrival time and request any special accommodation by contacting the regatta director. We will try to accommodate every request and ensure that there are adequate space for you, but please note that actual placement is on a first come, first serve basis. 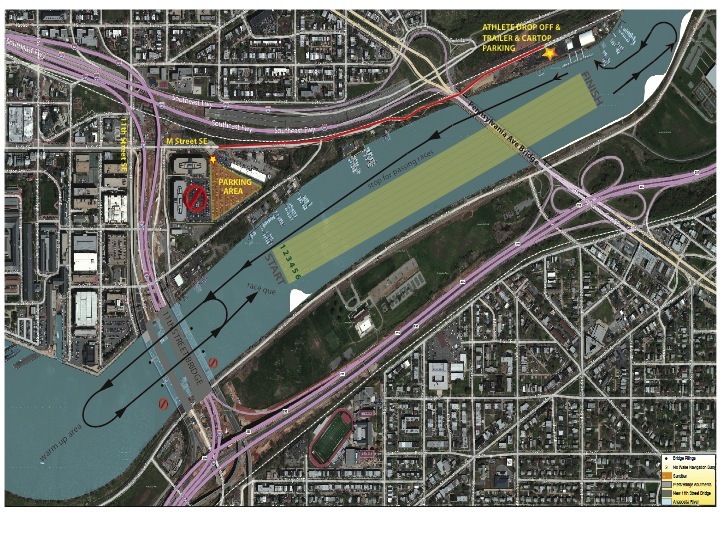 Parking for rowers and spectators will be at Maritime Plaza Upper Parking Lot on M Street SE DC, which is approximately 0.5 mile from the boathouse and race course. 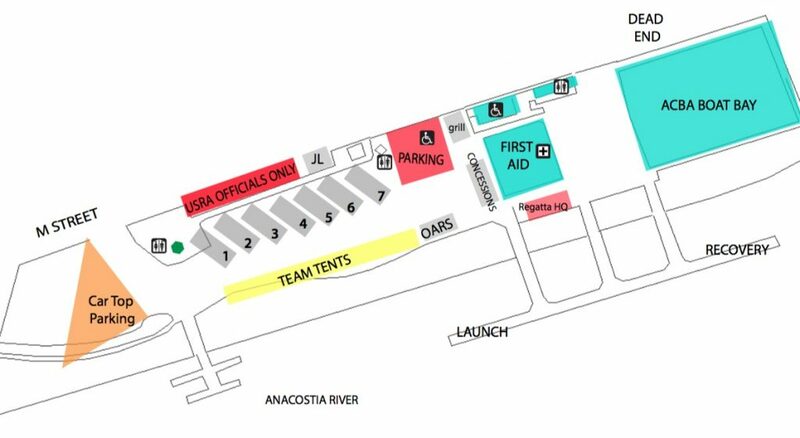 Upon entering M Street, Regatta volunteers will help direct you to the appropriate location. A free shuttle will offer pick up and drop off service for rowers and spectators between the parking lot and the boathouse. Rowers and spectators may be dropped off closer to the boathouse at the designated drop off location. 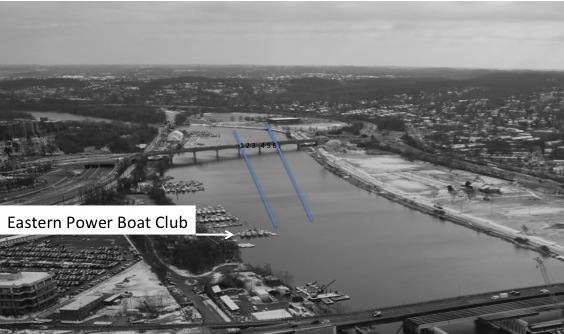 Boat trailers, car top scullers, race officials and handicapped parking is available at the ACBA Boathouse, 1900 M Street SE, Washington, DC. REQUIRED: Parking pass must be displayed on all parked vehicles. NOTE: Vehicles parking at non-designated area along northeast direction of M Street SE, DC will be towed or ticketed by the DC Metropolitan Police. Enter “38.8782,-76.9796” as your destination. From I-295 NORTH: Take the exit (on right) toward Martin Luther King Jr. Ave SE. Keep left at the fork to continue toward Martin Luther King Jr. Ave SE. Turn right onto Martin Luther King Jr. Ave SE. Turn right onto O Street SE/Water St SE (first right after the bridge). Turn right onto M Street SE. Continue to the boathouse. From I-395: Take the 11th St SE exit. Turn right on 11th St SE. Turn left onto M Street SE. Continue to the boathouse. From 295 SOUTH: Take the exit (on right) toward Martin Luther King Jr. Ave SE. Turn left onto Martin Luther King Jr. Avenue. Turn right onto M Street SE. At the circle, turn right into the parking lot. Continue to the end of the parking lot, then turn left into the upper lot. From 295 NORTH: Take the exit (on right) toward Martin Luther King Jr. Ave SE. Keep left at the fork to continue toward Martin Luther King Jr. Ave SE. Turn right onto Martin Luther King Jr. Ave SE. Turn right onto M Street SE. At the circle, turn right into the parking lot. Continue to the end of the parking lot, then turn left into the upper lot. From I-395: Take the 11th St SE exit. Turn right on 11th St SE. Turn left onto M Street SE. Keep going toward the traffic circle after 11th Street. At the circle, turn right into the parking lot. Continue to the end of the parking lot, then turn left into the upper lot. These are volunteers positions on land, including set-ups, selling merchandising, directing parking traffic, etc. These are volunteers positions on the water, including launch drivers, stake boat holders, dock master, launch and recover assistants, etc. If you have any question, please contact capsprints@capitalrowing.org. The regatta includes sweep and sculling events for junior, master, open, and adaptive rowers. The AA Master’s category is also recognized. The novice categories does not have age requirements. All races are 1000 m. We expect to have great competition for all entry interests. The Robert E. Day, Jr. Capital Sprints Regatta began as a scrimmage among cross-town rivals and has grown into a summer racing tradition for rowing teams all over the DC area and up and down the East Coast. It was renamed in honor of Robert E. Day, Jr., in 2018. Each year, more than 200 youth and adult athletes with various physical ability compete in 30 plus rowing categories during the day-long event, capped with music and sometimes a post-race BBQ.